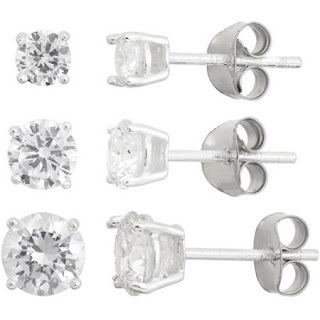 White CZ Round Sterling Silver Stud Earrings Set - Only $3.77 + FREE Store Pickup! 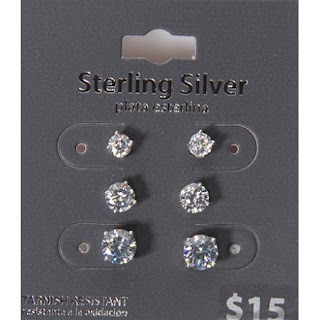 Check out these White CZ Round Sterling Silver Stud Earrings Set at Walmart.com for Only $3.77 (reg. $15.00) + FREE Store Pickup! (Availability of item and pickup depends on area). This stylish Sterling Silver Stud Earrings Set features three pairs of studs. There are 4mm round CZ included along with 5mm and 6mm studs, giving you versatility and options. These CZ stud earrings sparkle and add a shiny, elegant look for your front earlobes or multiple piercings. Every piece of Walmart jewelry passes rigorous inspection at our Quality Assurance labs. So you can buy with confidence — guaranteed.